one piece Create Your Own Devil Fruit! The title explains itself. This is a place where you can make your own Devil Fruit. As we all know there are three types of Devil Fruit: Paramecia, Logia and Zoan. You can choose which ever one you want to make. Here is an example for how you should make them. Those are the main guidelines. Now we know the weakness of Zoan Types, but Paramecia and Logia are different so if you make those ones then remember to put the weaknesses of their DF abilities. Like how Crocodile can be hit if doused with water or how Enel's lightning does nothing to rubber! Here is my first devil fruit! 1)	This is the regular form of the person that eats this fruit. The eater’s eye color is now a mineral gold color and the whites of their eyes are now pitch black. The eater’s teeth, finger nails and toe nails turn into pure gold and their hair changes to a gold color. Thin lines, half a centimeter thick and made from pure gold, are spread throughout the eater’s body. There are two lines that start at the bottom of the eater’s eyes and extend to the eater’s ankles. The lines separate into five as they go to the end of the toes. Two other lines start at the shoulders and extend to the wrist and separate into five lines as it reaches the finger nails. 2)	This is the middle stage of the fruit. The K9 teeth of the eater grow out to double its regular size and their nails turn sharp giving the eater claws. Also, the thin lines throughout the eater’s body expand to a centimeter wide and spike up until it protrudes two centimeters out of the eater’s skin making the gold lines act like small blades on his body. (The lines or as hard as steel) Two large gold spikes that resemble the tips of two large wings protrude one foot out of the eater’s back. 3)	This is the final form of the fruit which turns the eater into the mythical griffin. When this form is activated, the eater’s face becomes eagle like with a beck. Their hair turns into large gold feathers that grow down the eater’s back. The eater now has large gold wings (wing span of 23 feet). The rest of the eater’s body from their neck down is covered in gold lion’s fur with their hands and feet resembling lion paws. Their claws have grown longer and their teeth are sharper. The fur and feathers on the eater’s body are harder than steel. The eater stands on their hind legs in this form. In the first regular form, the eater is able to levitate up to 6 feet off the ground. In the middle form, the eater is able to fly and their skin is hard like stone. In the final form, the eater can fly at the speed of sound and is capable of shooting feathers from their wings like bullets. The eater’s body is as hard as steel in this form so the feathers are like knives. The eater also gets enhanced strength and senses in this final form. I don't understand how it is like Marco's abilities other than the fact that it is a mythical zoan type fruit! Apperance : Muscular Endurance and incerease : one the furit is consumed the one who ate the furit get's incereased bone Desnity and incerease in muscel mass and endurance the user's muscel's grow about 3x there Orginal size and the weight of the person doubles. also they grow an extra foot in seconds makeing this transformation extermely deadly. super strength : most noticeable thing about the blade masters furit is that the person who consume's the furit can now lift up things 50x his size and 400x his weight also the skin of the consumer become's like steel bone desnity incerease's too allowing the user to be shot and get back up. speed : the second most notice able thing is the fact that the user can move at near sonic speeds the user can move so fast that if the consumer were to slash at these high speeds the slash is so delayed that the people who are being slashed can still move for 5 seconds. Senses : the 4 sense's are incereased as well to cat and dog like proptions the user when trained can smell and hear up to a Mile away. the eye sight of the user can now see about 20 feet ahead also everything for the consumer is slowed down with his inhanced eye sight much like how an egal sees in slow motion the consumer sees in slow motion. the actual real power of the blade master fuirt is regeneration the user can regenerate as long as a bullet isn't put in there head the user can regenerate limbs organs and recovers in no time from injuries. Also the consumer for some reason gains the abilty to cut through all metals includeing Diamond. Apperance : Zetsumi has shoulder legnth black hair going a bit past his shoulder blade he also has pierceing red eyes he wears a sleevless black trench coat however he wears wraps that go up to his forearm and he wears black finger less gloves he also wears the same type of pants Zorro wears he wears a pair of Red Geta he also carryies eight Katana two on each side and two on his back both hilts faceing the left. Persnailty : Zetsumi is careing when it come's to his friends witch he has few of other than that he is a cold heartless killer and will do everything and anything to kill a good bounty he also has been hired by the navy several time to catch pirate he's even had a encounter the red haired shanks, he also will go hunt another bounty hunter if need be his motto is if he's not with the navy he's agaisnt them if he's not with pirate he's agaisnt them he has also had moments where he's been extermely friendly and funny but don't let this fool you or else you'll be his victum :O.
Bio : when Zetsumi was a little boy and growing up on a iseland just outside of japan his dad had owned a Dojo and was the "best" in town his father was also extermely strict no matter how good Zetsumi was his father wanted perfection so on stormy evening a man in black cloak offered Zetsumi ultimate power Zetsumi accpeted this offer not knowing what it he had agreed to , the man than forced him to eat the first blade master furit ever after Zetsumi consumed that the man forced him to eat a Logia furit of witch Zetsumi burst into a flame buring the man in the cloak to death by mistake and also killing his father and mother and burning his dojo after the burining stopped he than vowed to never trust a pirate or anyone but him self ever again he currently has a hide out in the grand line and has obtained eight rare swords. the most he's been useing is 5 two in his hand one in his mouth the other two lodged in between his toes. Ability: Your body can produce flowers or flower petals and control them . Also you can create vines from your body with or without thorns. The size and thickness of the vines and thorns are upon the users desire. You can detoxify someones or your own body from uncomplicated poisons or just toxins from the body. You can make yourself feel rejuvenated by releasing roots from your feet into soil. Doing this can get rid of hunger, small injuries and speeds the bodies healing. But when doing this your body can't move. You can also create bouquets or flowers from the palm of your hand or release flowery aromas. Appearance: The fruit is purple with green leafs at the bottom to make it look like a flower. The leaves have no design but the fruit has a wave spiraling from the top to the bottom. It enables its eater to use any of the devils fruit powers anytime he/she wants. even the made up ones AND I ATE IT!!! Able to control and become wind.And travel fast as the wind. The modes: Tornado mode and huricane mode. When use swords with this power you can make the with cut things apart. Able to turn into water and the powerful part is that you can go in the sea and not drown. Instead you can control the sea witch make this different from all the other fruits. And it also meens that sea prism stones are no affect to this power.And able teleport anywhere once it touches the seas. Weakness:Ice will turn you back into a normal body. Modes:Force sheild mode and the stronest black hole mode witch litterary the power that could destroy the planet. And also is able to controle the gravity in a certain amount of distance. Hope you like my ideas. The Water-Water Fruit , the only God fruit in the one piece world. It the same as any logia fruit but with water. This would be an obvious advantage over any devil fruit since they all are weak against water. Thats the reason for the name God fruit since it is the natural enemy to a devil fruit. The weakness would be sky, just like the devil fruit weakness is sea. So, the higher the God fruit user would go above sea level they would get weaker. And I'm sure if it existed the Marines would make a Sky Prism stone to counter it. This allows the eater to grow any kind of metal stone or crystal onto their body. It can be used to make armor, shoot off like bullets,or to make money. if the enemies attacks the user of bee-bee fruit,the attacks of the enemies will not damage the bee-bee user,because the bee-bee user can turn his body into bee,s and dodging every attacks of the enemies like creating holes so the attacks of the enemies will be missed ,so that bee-bee fruit is called mythical zoan type like logia. 1.honeydrops:wall-the bee-bee user releasing many bee,s and dropping a honey drop to create a wall so he can defend herself to the attacks of the enemies. 2.100,000,000 bee,s:stings strikes-the bee-bee user summons 100,000,000 bee,s and striking enemies by bee,s stings, so that the enemies body will be have swollen. 3.poison stings-the bee-bee user summons many bee,s and injecting enemies with bee,s poison stings,so the enemies will die in one minute. 4.paralyzing stings-the bee-bee user summons many bee,s and injecting enemies with bee,s paralyzing stings so that,the enemies will paralyze in one minute. 5.bee,s honey-the bee-bee user create a honey with his bee,and whoever drink it will be full regeneration. 6.wing,s of the bee,s-the bee-bee user can create a wing with his bee,s so the bee-bee user can fly. 7.antena,s of the bee,s-the bee-bee user can feel if the enemies are gone or not because of the antena,s of the user. 8.100,000,000 bee,s stings:tsunami-the bee-bee user summons a 100,000,000 bee,s to create a stings like tsunami and when it fall down the enemies will injecting by bee,s stings that kills enemies. 9.beeleave-the bee-bee user use beeleave to blink/teleport. 10.200,000,000 bee,s:giant bee-the bee-bee user summons 200,000,000 bee,s to create a giant bee that all the 1-9 skills of the bee-bee user turns into giant and this form was a mythical zoan type that only hakies and weakness that can damage this bee-bee user. WEAKNESS:ice,fire,thunder,wind,water and rock because it is super affective. Abilty to turn user into solid rock to either shield self from attacks or simply break down into rock pieces to avoid them. User can also create solid rocks to use in offensive and defensive means. The user can also travel underground at high speed. Earthen Fist - covers the user's arm with solid rock to empower his/her punch or to use the fist-shaped rock as a projectile. Pillar of Judgment - creates a giant pillar made of solid rock which the user then throws to enemies to crush them.It has enough power to defeat a giant even if the user is still not used to his/her abilities and if the user is already an expert with his abilities, it might be able to defeat a vice-admiral in one use. Earthen Sphere Prison - covers an enemy with solid rock until it turns into a giant ball. The user can then control the ball to smash the rock down to the ground at great speed or immobilize the enemy so that the user can setup an attack on the enemy inside the ball. The user can also use this on himself to defend against oncoming attacks. Great King Tsunami - The user slams his hands on the ground which then creates an ground tsunami that can obliterate enemies. Weakness: The only way to hit the user is by using Haki or drench the user in water to nullify the user's ability to break down to rock. The user gains the ability and power of the sun. The user can cover his/her body with the heat of the sun to fend off physical attacks or to empower his attacks. The user is immune to being burnt to a degree of nullifying the intense heat of magma from the Magu Magu fruit which allows the user to neutralize even the intangibilty of the Magu Magu fruit eater. The user can also manifest solar energy for different offensive or defensive means. The user is only weakened by Kairoseki or being in a large body of water. Appearance: The user's body can shift from becoming solid, gas, or liquid. This makes their body seem very, very different each time they use the Fruit or intend to fight. This can take on the appearance of any liquid, gas or solid substance, including water, however, they cannot become water when immersed in the substance. Their appearance has little effect on the environment around them, i.e. freezing themself to become ice, as opposed to water, will have little effect on anything else around the user. Being ice will not give them the ability to manipulate the substance. Butsuri No Kaze: This is the special wind created by a perfect control of anything involving physical manipulation. This differs from wind in general, as this can use gravitational forces to change the max-windspeed and pressure of each gust that blows. While this may sound complex, this actually exhibits particular patterns of the wind in the 'Roaring Forties', a weather pattern that only is shown on countries that exist within the 40-latitude line of Earth. Basically, the user can control the wind around the different kinds of weather that appear in the Roaring Forties, which involve heavy southerlies and drastic nor'westers. The pressure of these weather patterns is important, because the power the pressure, the more chance of 'typhoon' or 'cyclone-like' weather. The user can use an unimaginable amount of weather patterns to cause storms, lightning, hail, rain and other effects, which all rely on a lower level of pressure for this to work. Butsuri No Jijou: This can use the concept of 'magnetic force' in order to manipulate ANY metal into acting the way that they wish. This could involve fastening metal objects onto a wall, or drawing swords away from their owners. Black hole: The user allows their body to become an irresistable force and they will attract large objects, pulling them in and attempting to compress them down to about 1/10th of their normal size. This can only work if the opponent is weak, or has no Fruit abilities, otherwise it is fairly easy to escape. Speed of sound: The user can speed up individual movements, allowing them to move at around 600 m/s. This can only be sustained for short periods of time. Special Power: The user can enhance the amount of gravitional pull around a specific object, including other humans. Weakness: The user is weak against lightning and thunder. Lighting disrupts the bonds between their gravitional fields, as wellas their aptitude for using physical applications in order to further their own goals. Thunder causes them to lose their concentration, as the user of this fruit has to have ample control, otherwise they will not be able to use their abilities to their fullest. Good fruits... @_@ but the godmoding fruits are too many..... Any humbler suggestions? I like the griffin one but firstly... Griffins dont have teeth :o blademaster reminds me of gorillas on hawkeyes island XD... Bees...ouch but a good one nonetheless. I think robin takes the blossom bloossom. Solar solar would burn up the earths atmosphere --_-- . Lastly whats the use of the instant travel :o takes the fun out of sailing. @papakyi10, Devil's Fruits aren't just for pirates, though I do agree with you on that one - instant travel is kind of pointless for most of the people in OP... Especially pirates. It would be a good Fruit for a CP9 member, though. Appearance: The user can transform into a black panther at will, gaining sharp claws, a muscular body and a black coat of fur, that can be used as camouflage in the dark. The user can also half-transform, turning into a half-panther man. Transformation 1 (Kurohyou ['black panther']) This allows the user to change from a man, into a panther and vice-versa. The user can change between the panther and man at will. Transformation 2 (Half-man/half-panther) The user transforms into a panther/man hybrid, where his body is much more versatile for upright fighting, rather than fighting on all fours. Because of the augmented strength of a panther, this transformation is very dangerous and gives the user incredible strength and dexterity. Meld: During night-time, or in dark areas, the panther cannot be seen, as the coat of fur is camouflaged. This can be used if the user is in panther form. Blink: When in panther/man form, the user can travel at high speeds, often getting faster than 100 m/s. Abilities: The Kebu-Kebu no Mi gives the eater the ability to sprout up to ten long, very powerful black cords from his back. These cord, if damaged by physical means, can regenerate incredibly quickly. However, if frozen, burnt, or damaged by any elemental means that would chemically change them, they will lag severely in their regeneration. The cords, much like plants, thrive in water. If they come into contact with water, they will grow longer and tougher by the minute. They are all controlled mentally by the wielder. Just made some minor adjustments, including a complete change of the name and abilities. But this was the initial idea I was trying to get at. I just cleaned it up a lot. @Zord. Yeah, it does make sense. XD. Fukka-Fukka no Mi user can do a resurrection or bring back any soul back to life within singles seconds also it can heal and take away the pain. The user is immortal and can kill with saying "*name of the person*, you shall die" sentence which means he can control the people souls and can predict the future and see through them. CaptainKuro... OP, just OP. Can kill by saying a sentence? That is ridiculous. Appearance: the only change that eater gains is his muscle mass and body weight incereases as the user has become a "metal" being. Abilities : the abilities of the metal-metal fruit relay around the usage of metal and Magnetism the user can do things such as "coat" his skin in Metal as well repel or attract metal like a magnet. The user can also do things like change shape of his limbs to weapons such as swords, guns cannons etc. The user is also able to Control other metal items. The weakness to this fruit is unknown. The user cannot control the Iron in some ones blood. The user can also create Metal weapons from metal objects but cannot change the substance of metal for instance say the user has 14 cooper bars and wants a sword the user can make a sword but it will be cooper he can't change the properties of the metal. Appearance : No change other than the user gains a "wind body" thus making him intangeable. Abilities : the ability of the Kaze kaze no Mi is straight forward it's also nick named the "storm storm fruit" for it's ability to control wind. the user can manipulate Wind and can do various things with it such as light breezes or Violent storms. The user can even create wind based disasters such as Hurricanes & tornadoes. The user can also shoot preasureized blasts of wind at a target or sickle shaped blasts of wind that slice through it's opponent. The weakness to this fruit would be fire to an extent as if an area is to dry they cannot use wind as effectively the same thing would apply if they were in a place where wind cannot be accessed. Appearance : The Water Water furit grants some A body made of water making them a water person. Abilities : the Abilities of this furit are simple the user can control and mainpulate Water but not just that they can also freeze and control Ice making this a rather powerful Logia type. The user of this furit is at a dis advantage in a dry area such as a desert or some one who has fire. Appearance : No change to the user as this is a Paramecia type devil fuirt. Abilities : This devil fruit allows the user to speed up or slow down the movement of objects the user can speed his or her self up to. The user can also create a sphere like dome in witch anyone who enters will be slowed down. The user can even stop certain objects from moving with enough concentration and practice. The weakness to this fuirt is the focus it takes to use the fuirts power as well as the time needed to set up the sphere zone attack. Appearance The user of this Zoan type Devil fruit gets the power to turn into a Demon. making this a rather powerful Devil fruit. first form : the users first form is standard nothing happens other than the user with time can manipulate black flames. The user also gains slightly more muscle mass upon consumption of the fuirt. Hybrid : the hybrid form of the kami kmia is odd the user sprouts two large wings that look like that of a bat. The user's hair also grows down to there back. The arms of the user also become coated in a black armor substance and the tips of there fingers point out like claws. The user also sprouts a Tail from there tail bone. Abilities : The ability of the fuirt other than transformation is the control of black flames known as hell fire. The user also gains nearly unlimited strength and strong endurance as well as increased speed. @Wolfmaster, I don't know, dude. The Kami-Kami fruit seems pretty unbeatable. Shouldn't it also have a major weakness, too? Ah, I see. That would make it much more balanced, I think. XD. Otherwise, it sounds extremely cool. Appearance : this is a rare paramecia devil fruit. Ability : The Naru Naru revolves around the control and manipulation of sound and sonic vibration the user can Launch and control Sound waves at an enemy as well as create a sphere like zone in witch the user can amplify sound and noises in the area. The manipulation of sound can be in the shape of a pressure like blast or flows around like water almost. the weakness to this fuirt is if quite literally if you have something to block your hearing or your good at ignoring loud noises. Abilities: Transports user places. Locations vary, it has to be in a mile radius. Abilities: Mind-Mind Fruit allows the user to read other people's minds, useful ability in battles as it can be used to known about incoming attacks before their release, confusing as it sounds the user is also capable of swapping someone's mind with the other, so they would gain control of someone else's body. In order to swap someone's minds, the user requires a lot of concentration. "Channel: Swap." - Ability that swaps target's minds, which can be used to multiple opponents. Can also be used to swap user's mind with target's. "Channel: Read." - Ability which allows the user to read other people's thoughts, can be used to multiple opponents but that would create a mass havoc inside of user's mind. Preferable count of targets, two. Weaknesses: Haki users are immune to "Channel: Read", water and strong waves of sound are very effective against the user of this fruit. what's the fuirts weakness ? what if the your fighting some one like Luffy who doesn't think how will this benefit you ? Well the Transport-Transport fruit exhausts the user the further they go. and the Aura-Aura Fruit just isn't very handy in a fight. but again Nate you need to have a great weakness with your Devil fruits power switching some one's mind is a bit OP. there's no defense or way to break it. Even Whitebeard had a great weakness with his fuirt and he's the strongest pirate of the sea. Look at the awesome power of the Yam-yam no mi that Marshal D teach ate. but he can still be defeated. Teach has full-offensive logia type which is another deal compared to my mental paramecia type, these two cannot be compared in terms of weaknesses or power, comparing this to Doflamingo's. Mine is far cry from that one. Three weaknesses is enough i think, i wouldnt dare to make another one: Water, haki, strong sound waves(primal weakness, example: This fruit user would be at great disadvantage against Naru-Naru no Mi fruit's user.). yes but Teach is also has great weaknesses with his fruit for instance he doesn't have the intangeable body most Logia users have. He can nullify devil fruit powers but you have to be close witch is also a disadvantage at it's self. keep in mind i'm not hating or scolding but giving and pointing out some key points to help your fruit seem more balanced.
" Giving and pointing out some key points to help your fruit seem more balanced." You're doing a good job, so far ^_^. Special Power: The user can modify any weapon he or she is carrying, modifying the distribution of mass and separating pieces of them. This applies to light armor as well. She can change the length, width, curve, and even separate the object into pieces (though in this case, it will always stay in line with the hilt). Weaknesses: The amount and size of the items that can be modified are extremely limited. Only a single weapon or piece of armor can be modified in this way, it must weigh less than 10 kg, and focus must be applied to the object in order to successfully change it. Each of these items has a tendency to try to revert to normal, requiring its user to continually focus his or her attention on it in order to keep it changed. This is still all mass redistribution, so the longer he makes it, the thinner and more brittle the metal becomes. The higher the grade of the blade, the less brittle it becomes, though higher grade blades require higher focus to keep in other forms. The user loses control of any piece of a blade or armor that’s cut off, and the entire item returns to normal if separated in this way, though it can quickly be modified again as long as any piece remains in the user’s possession. Abilities: The users of this fruit are capable of turning their entire body into a black smog that can pass through anything without reciving any damage unless "Haki" is used. Smog's size can be adjusted, - From 1m width and height to 10m - the negative effect of this smog to the others is that the moment they breathe it inside of their lungs they would begin suffocating as the smog would fill the inner organs, only way to escape it is getting out of the smog. Weaknesses: Haki users, the ability will wear off inside the water and the user cannot turn himself into smog under sunlight which leaves this ability only available during the night or inside buildings/ rooms. Abilities : This is an odd Logia type as it allows the user to control and become "Energy" this is easily mistaken as the light fuirt. However this allows the user to shoot out beams of energy that can melt through or disengerate objects & people. The down side to this fuirt is that it requires alot of stamina to be able to use this fuirt effectively other than that it holds the standard devil fuirt weakness. 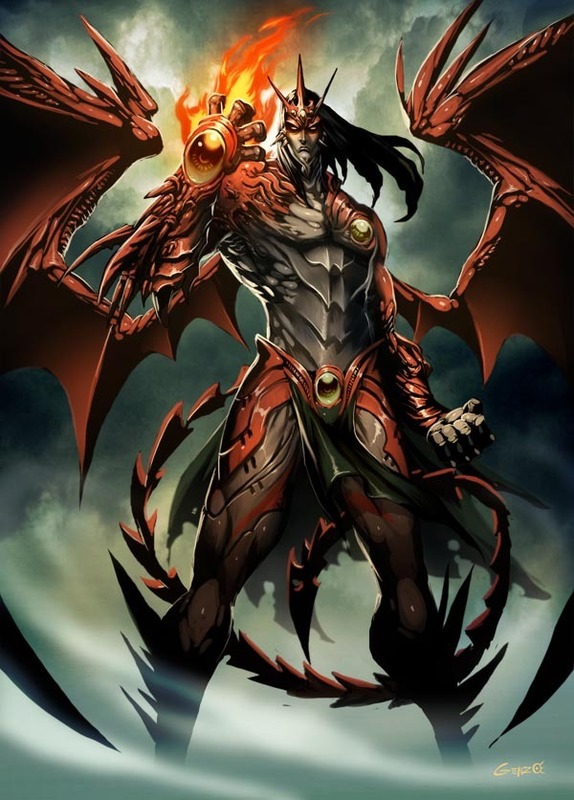 Appearance: The user can shift between a completely human appearance and a dragon appearance. They can modify this to their choosing, meaning they can become as 'Draconian' as they like, or as human as they like, but they cannot become completely dragon. If they don't switch back to human form after ten minutes, the user will automatically be shifted back, due to time constraints. Densetsu Doragon ('Legendary Dragon') This is the transformation to become a dragon completely, without any human-like appearance, whatsoever. This can only last five minutes. Soukou Hakari ('Armored Scales') Can temporarily strengthen scales in Dragon form, or Hybrid form. This hardens them beyond the strength of steel. In Hybrid form, this ability is known as: Kousotsu ('Armored warrior'). Weakness: Water. Not just being in water, but being doused by water, or by ice will have adverse effects on the user of this Fruit. The only way to escape this weakness would be to use Dragon's fire on the water, or ice before it reaches the user, otherwise they will be greatly weakened. Also weak against the 'Colour of Observation'. @Nate. I think it is actually quite an interesting Fruit you made. It reminds me of Mantra, or 'Colour of Observation', which, funnily enough, is immune to your Fruit. This is much more interesting than Doflamingo's abilities, which sound cheap. Your actually has a 'basis' to it and is easy to understand, as well as not too OP. I like it. @Wolfmaster. I think you may be overreacting to Nate's fruit a bit, It is actually quite a good one, in comparison to some of the other ones on here. XD. Also, I was hoping that you would add your Admiral's Fruit on here, when it is done. I'm guessing it will be a Logia-type? Ability: The user can control both the amount of sweating he or she does and the chemical makeup of his or her sweat. This includes, but is not limited to, liquids with poisonous, caustic, reparative, and hallucinogenic effects. He or she is immune to any and all dangerous chemicals he or she creates. Weakness: Sweating still dehydrates him or her as per normal. This only lasts as long as the sweat remains in liquid form. If it is evaporated or frozen, its chemical composition returns to that of normal sweat. Any chemical the user tries to create that is impossible will result in an uncertain chemical result and tremendous side effects for the user.